This poster joins a series of social awareness posters we have developed over the years. In this series, we want to bring attention to the issue of gun control in the US. This poster was created in the wake of yet another tragic school shooting. 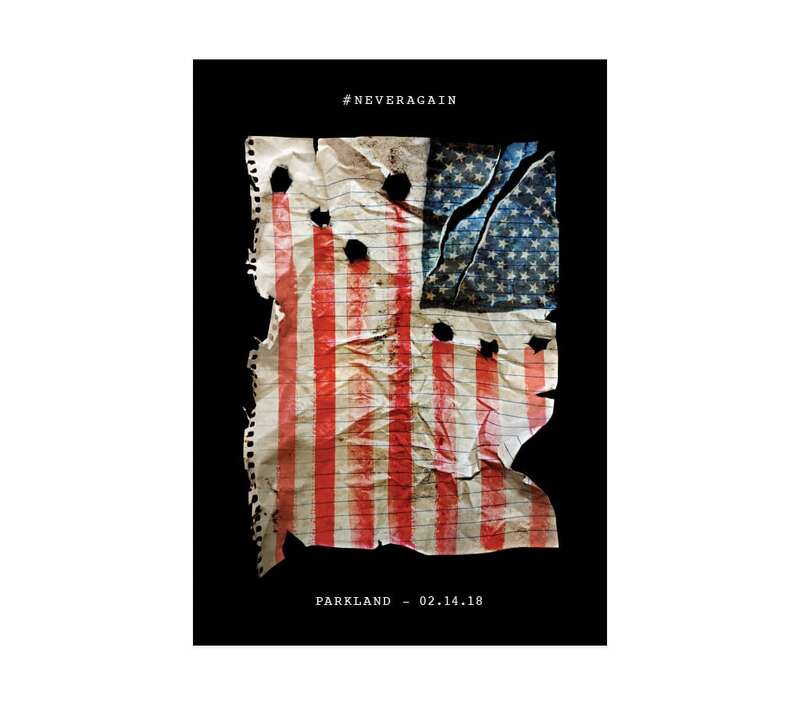 Each poster in this series begins as a visual play on the American flag and is then coupled with the tragic event it is highlighting. In this iteration, we created many versions of the flag before we settled on creating this illustrated version, which is a combination of hand-drawn watercolor strokes, composited with ruled paper, which was then photographed before being embedded into the overall design. In keeping with the recurring theme, we used minimalist typography to accentuate the tragedy. 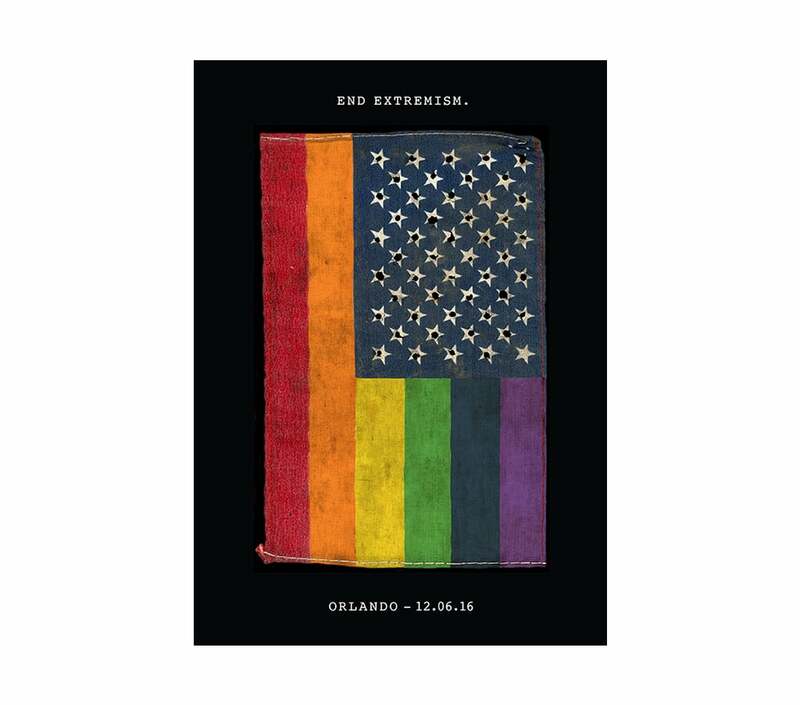 The end result is a poster that focuses attention on Parkland, as yet another national tragedy of senseless murder. Our hope is that these posters will continue to engage and move the dialogue forward for this important issue in our society. 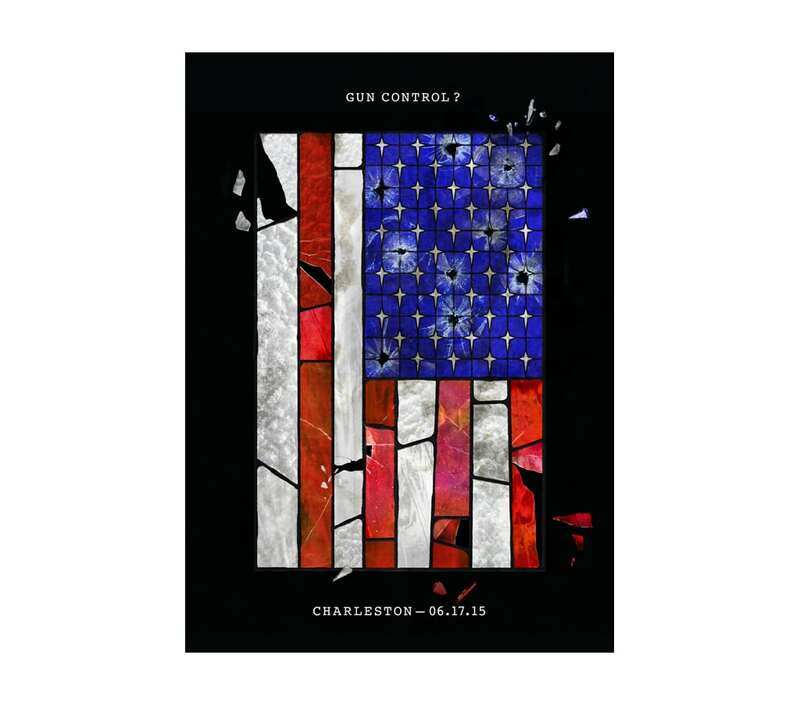 The Orlando shooting tragedy drove us to create a poster to bring attention to the recurring issue of gun control, and the role guns play in these tragic events. Regardless of the motive, guns are invariably involved in all these mass shootings. 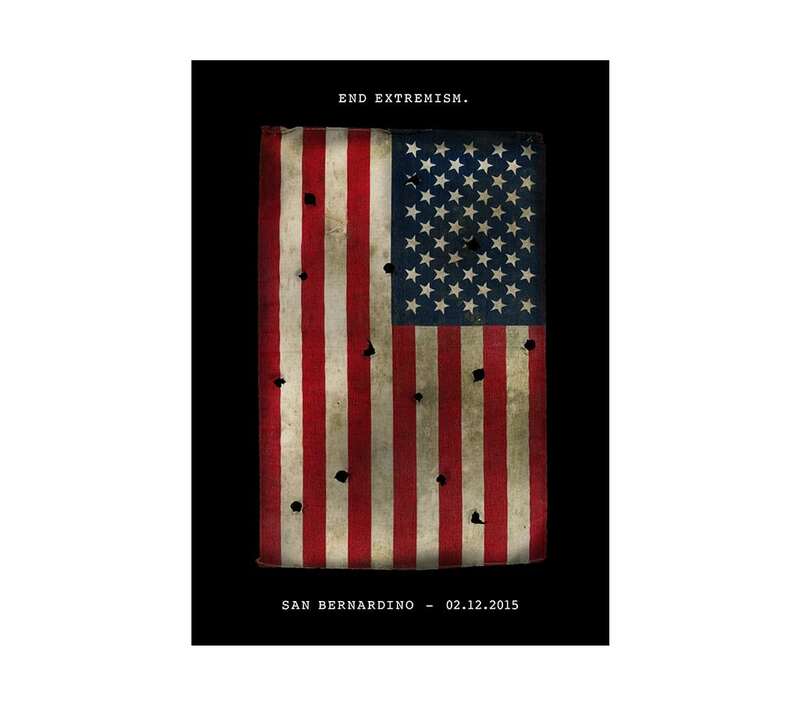 We knew we wanted to create an image that used the American flag, along with the bullet holes with each star representing a victim in the shooting. We went through many iterations of the flag, from illustration to photo recreations but we still felt the flag component wasn’t quite right. One day, while cleaning out the studio we came across a cardboard box that contained a small, old and weathered flag, and immediately we knew we had the right image for this poster. We photoshopped the rainbow colors and used an old archive image of bullet holes to complete the poster. We wanted the typography to be minimal (initially we were inspired by the simplicity of On Kawara’s date paintings) and yet be a powerful reminder of both the aim of the poster, as well as the time and location of the tragedy. This work has been selected by various media for awards and publication, which greatly contributes to getting the message out to the public. To date, this poster has been featured in Graphic Poster Annual 2017, Creativity International, How International Design Awards, AIGA Philly Design Awards, & Creative Quarterly 47. 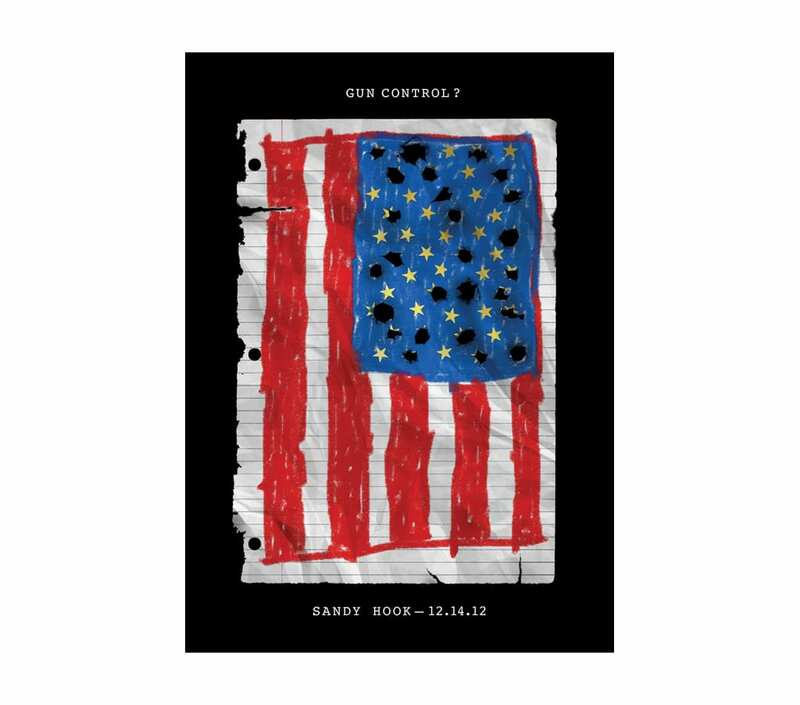 The Sandy Hook tragedy was yet another senseless event that encouraged us to create a poster that brings attention to the recurring issue of gun control. Once again, the American flag is the key element, with each bullet hole representing a victim in the shooting. The finished result is a large format poster that speaks directly to the tragedy of the Sandy Hook shooting, while also asking the fundamental question about gun control. The Charleston shooting tragedy was yet another senseless event that once again, shocked the nation, and brought to the fore issues of race and the prevalence and availability of guns in our society. On top of that, the fact that the shooting took place in a church also highlighted the vulnerability of the public, where even a place of worship can be a target for extreme violence. We went through many iterations of illustrating the flag as stained glass. As in the other iterations of this theme, we kept the typography minimal to be both a powerful reminder of the aim of the poster, as well as the time and location of the tragedy. This is the first poster we designed to highlight international terrorist attacks. 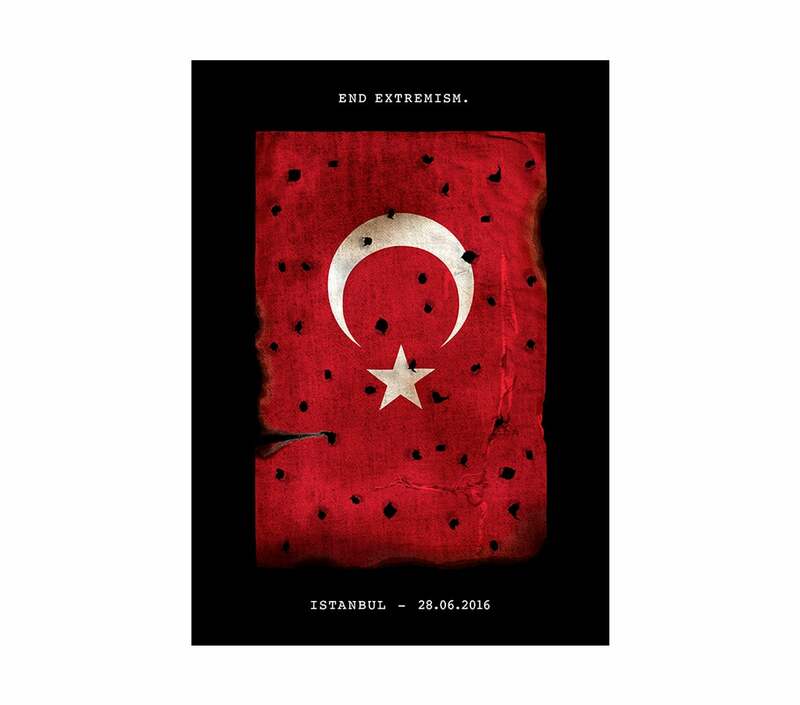 In June, 2016, gunmen stormed the Ataturk Airport in Istanbul. They were armed with machine guns, and explosive belts. By the time the attack ended, they had killed 45 people and injured over 200. This is the second poster we designed to highlight international terrorist attacks. 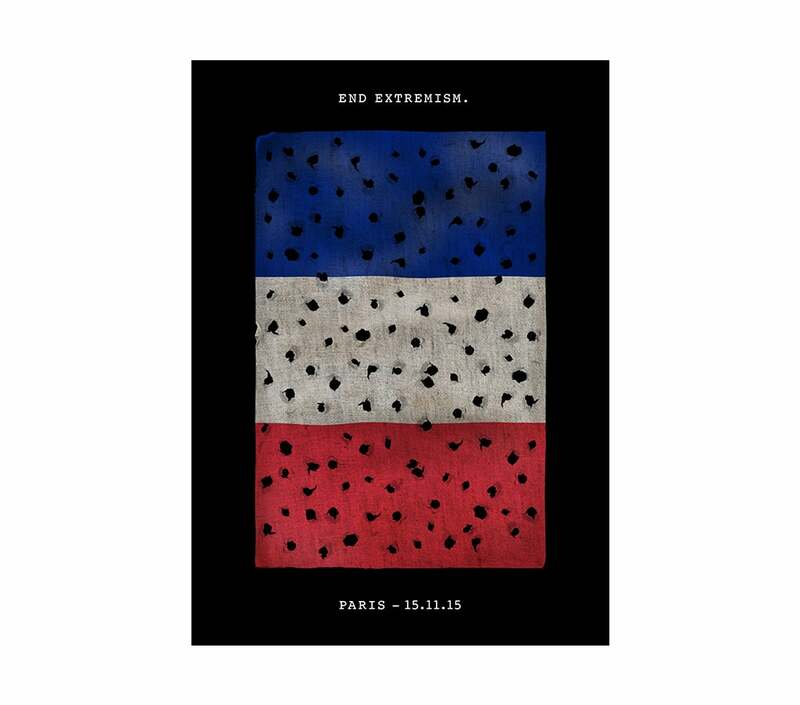 In November, 2015, gunmen carried out an attack at the Bataclan music venue in Paris. In all 89 people lost their lives in that attack and several hundred people were also injured, with almost 100 people seriously hurt. In December 2015, a terrorist attack at the Inland Regional Center in San Bernandino, left 18 people dead and 22 were also seriously injured. 8. No Vote? No Voice! 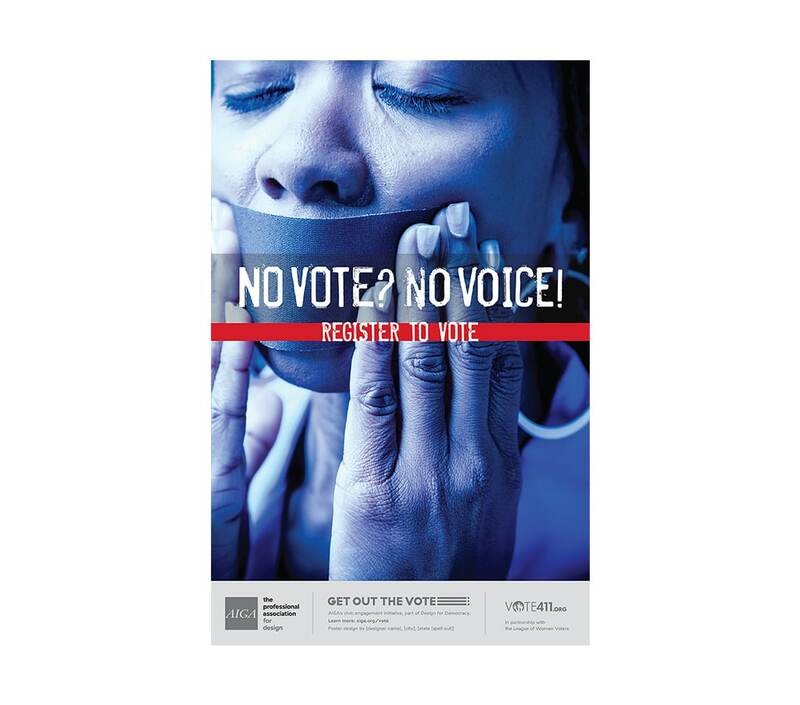 In the run up to the 2016 National Election we took part in the AIGA campaign to encourage people to register and vote. Our contributions to this national project were designed to highlight that not having one’s voice heard by not registering could have impact. While campaigns such as this were successful in raising awareness, and the majority of the public voted for Hilary, we are living with the consequences of those election results. If anything, being part of this process encouraged us to become more active politically, and be vigilant as to what is going on in our country. This poster were later picked up by Paul Loeb the social and political activist, for his national Campus Election Engagement Project where they were used to support their cause for the 2016 presidential campaign. Every designer involved in this project donated their services to this worthy cause. 21xdesign donated this poster for The Hurricane Poster Project, to help raise funds for the victims of Hurricane Katrina. Posters were sold on a dedicated website to raise money for this tragedy. While the actual website no longer exists, you can read more about this project here. This poster was subsequently awarded a gold award and featured in Graphis Posters. 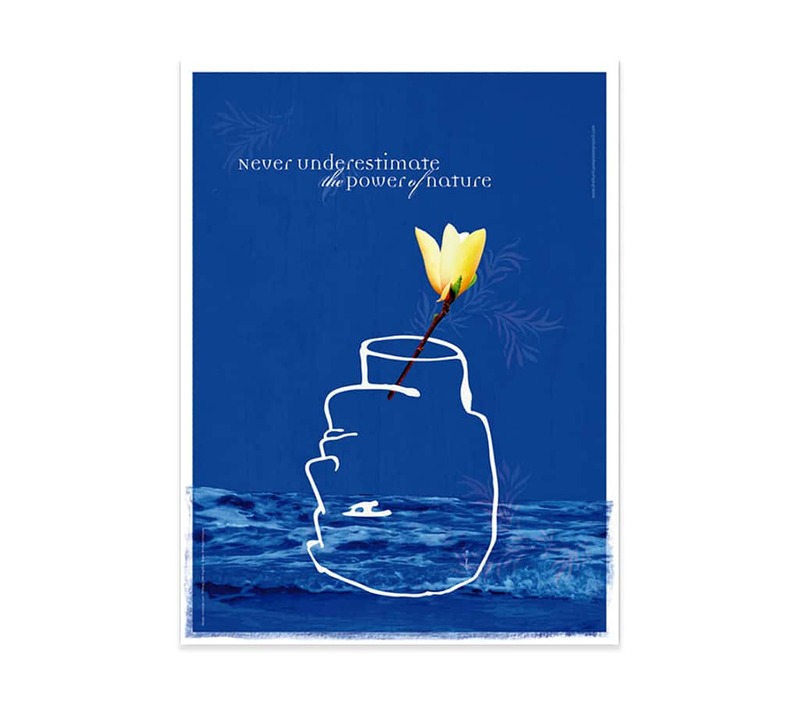 It was also selected for an exhibition commemorating the 20th Anniversary of the Chernobyl disaster and selected for a touring poster exhibition held in Louisiana and in an exhibition of global posters, held in the Ukraine. Inspired in part by Robert Indiana's Love & Amor sculptures, both of which are located in Philadelphia, we wanted to create something that was both typographic, and something that could be easily replicated to bring the message across. But at the same time, we wanted a type solution that had a sense of urgency about it too. After several attempts at illustrating the type, we were looking through our photographic archives when we came across some images of beautiful stenciled type on a dark wall that we had taken on a trip to Rome, a city filled with some great graffiti. Immediately, we thought that using some kind of a stencil could add some drama to the poster. It was fun creating the stencils, and spray painting the letters on a blackboard. The whole poster was then scanned and assembled in Photoshop. 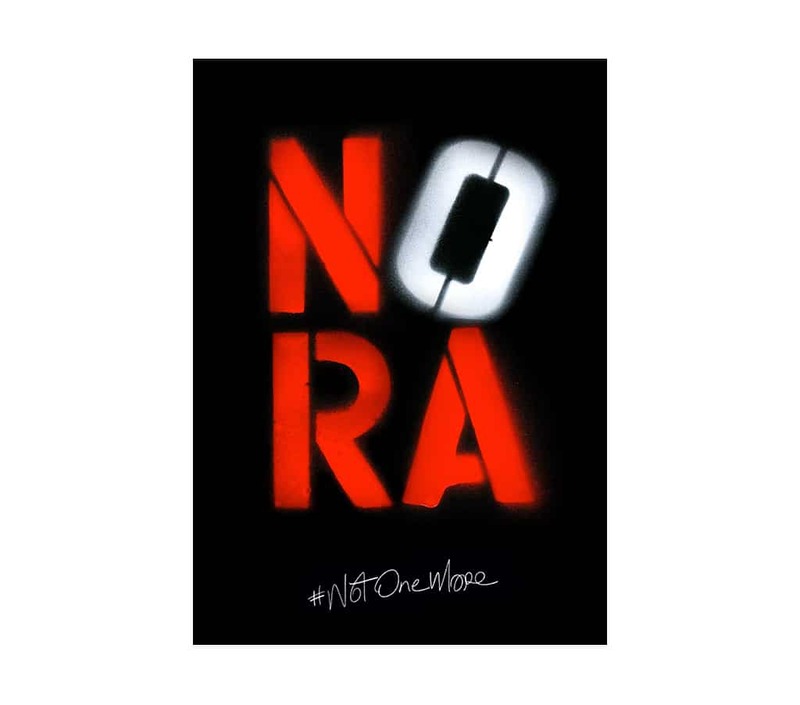 The end result, we believe, is a poster that speaks directly to the detrimental role the NRA plays in the discussion of sensible gun control. We like the typographic directness of the poster and the fact that the poster could be replicated as a DIY poster project.